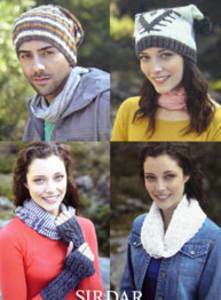 Slouchy striped hat: 1 ball in each of 3 colours. T bag hat: 1 ball main shade, 1 ball contrast. Armwarmers: 1 ball. 50g balls Sirdar Click DK.